Unbeaten cruiserweight Craig Kennedy (14-0, 8KO) will call on the experience of his long-term mentor as he bids to build a fortress at the new Ice Arena Wales in Cardiff Bay. 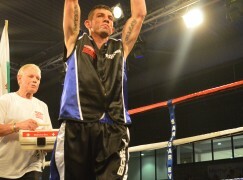 Steve Robinson, who has trained Kennedy since his debut in 2013, cemented his legacy with seven consecutive WBO world featherweight title defences at the old Ice Rink in Cardiff. That run of form in the early 1990s saw the ‘Cinderella Man’ successfully defend his belt in high pressure domestic dust-ups against the likes of Paul Hodkinson, Colin McMillan and Duke McKenzie. Kennedy, who has called on that unrivalled experience for advice, said: “For Steve, it’s a big deal for him. Obviously, it’s going to bring back a lot of memories and he’s able to pass some of it on to me. We do a lot of work together on blanking out the crowd in those big occasions. I’ve got a friend who does some sport psychology with me and controlling my mind, too. On Saturday, when Kennedy tackles Belgium’s tall Joel Tambwe Djeko (9-1-1, 4KO) for the IBF International title, it will be just the second time he will have appeared in his home city. The 30-year-old is keen to make nights like it a regular fixture in the Cardiff calendar and make memories of his own. Known in the east Cardiff areas of Rumney and Trowbridge as ‘The Kid’, Kennedy is renown for owning one of Welsh boxing’s biggest fan bases. Even without the impending exposure of terrestrial broadcaster Channel 5, he has sold tons of tickets across the capital for his 14 previous fights but this time it’s been off the scale. Kennedy said: “I’m not 100% sure where we are right now but the last I knew, I sold about 700 tickets. It’s been absolutely overwhelming, y’know? I’ve got a massive following anyway but the fact that it’s in our home town of Cardiff, people have just taken to it. It’s for a title and the response has been overwhelming. Honestly, you’ll see on the night, the amount of tickets I’ve sold is absolutely ridiculous. Barry McGuigan’s Cyclone Promotions, who host Saturday’s fight, have made no secret that the new venture needs public support. Kennedy is mindful of the obligation to play his part and fitted it around a busy training schedule, joining his partner Jo and brother Stephen to deliver tickets to fans in person. It’s tested Kennedy’s time management skills but he’s sure the investment will convince McGuigan’s team to return regularly. Kennedy said: “If this goes well and all us boxers fulfill our ends of the bargain, selling our allocations, then it’s going to be a sell-out. 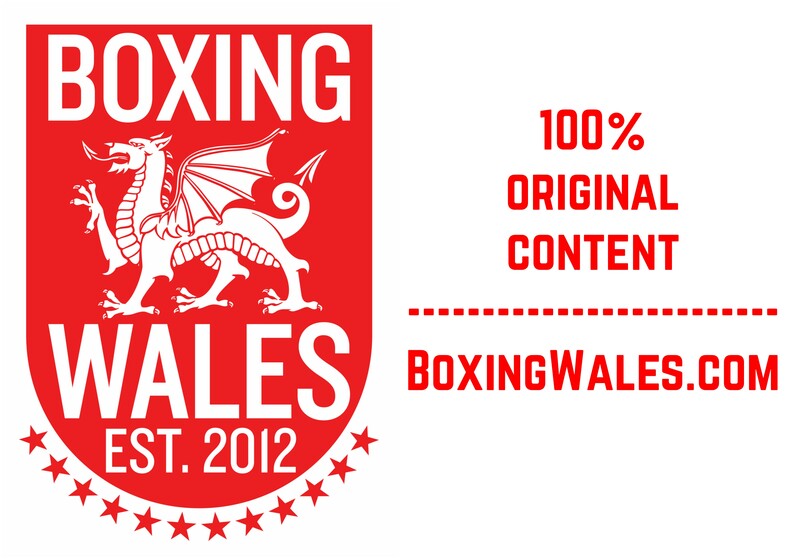 Fingers crossed, it’ll be enough for Barry McGuigan to keep bringing big time boxing to Cardiff. We need the Welsh public behind this. 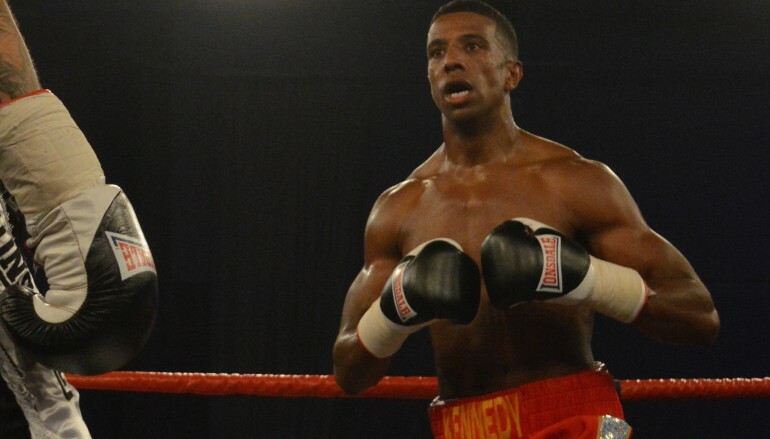 Also trained by Llanrumney Boxing Club’s Tony Richards and managed by Sanigar Events, Kenendy has craved the sort of test like Djeko, who drew with unbeaten European title challenger Bilal Laggoune, for some time. 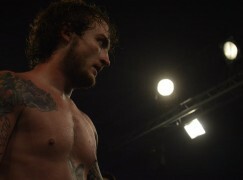 The contender out-grew the small hall scene in 2015, scoring wins over Wadi Camacho and Courtney Fry, and has no plans to return there, leaving the Ice Arena behind. “I’ve been down there (Ice Arena) before, the venue is second to none. The ceiling is low, good for atmosphere and I’d like to think it could become my home ground,” he said. 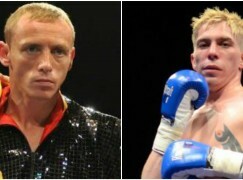 “There are not many venues here suitable for me and the boys on the card but this could be. The hurdle to overcome isn’t a small one – Djeko stands closer to seven foot tall than six and has knocked opponents out with both hands. There’s limited footage available, most likely because Djeko is head of the ‘Who Needs Him’ Club and Kennedy is aware that he could be headed in to the unknown. He said: “I leave it to the team, I don’t do too much research on any of my opponents. I did have a little sneaky look one night, he’s okay across the board. He can be quite flamboyant but Steve has seen flaws and we’re looking to capitalize on that. We’ve based our training on counters, naturally it’s my God given talent and when he makes mistakes, he will be punished. Heading in to his last fight, Kennedy was still grieving from the loss of his close friend Simon Lewis and his unborn son. 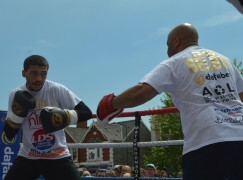 The community united, raising over £30,000 for the Lewis family and Kennedy entered the ring with his friend’s face printed on the team’s t-shirts. Cheered on by Simon’s closest relatives at ringside, Kennedy disposed of the always durable Lukasz Rusiewicz in less than nine minutes and feels if he can come through that emotional pressure, he can come through anything. He said: “Believe it or not, the last fight with everything of my friend who sadly passed away and all his family ringside, everything we’d been through over Christmas… it wasn’t good times.